Birth data for casting charts for those with academic interest. I have been wearing emerald for past 15 years. I have progressed well in my career (after a long struggle). Recently, one astrologer told me to wear yellow sapphire in addition to emerald. Later I found out that sapphire and emerald can not be worn together. Another astrologer suggested wearing “Moonga” and suggested to not wear emerald or sapphire. Now I am completely confused. I still continue to wear emerald but would like to know if it is the right stone for me. If I should wear a stone or not. I am a doctor by profession. Purpose of the stone is to progress in career and work. This is a classic case of Gem therapy going wrong at the very outset and as described by Guruji Shrii Arnav in his timeless and classic article” Do Gems Work-No they do not for 90% of the people”. This is the case of incorrect recommendation and Incorrect Gemstone category as per the article. This happening despite the individual being a qualified Doctor and having better than average intellect and resources still as alteration of Karmik Life map is not easy these errors creep in. 1) He has been wearing an Emerald. He has been recommended Emerald just based on his moon sign. What his earlier Astrologer has failed to consider that Mercury the ruling planet of Emerald stone is a block creating planet for Cancer Ascendant being the lord of the 12th house of expenditure and losses and the 3rd house of siblings and short distance travel. 2) The second error which has worked out strangely positively is that he has been wearing the Emerald for 15 years. The period of maximum effectivity of an Emerald is maximum 5 years after which it should be changed for any kind of astrological benefits and results. 3) The third thing given the above two explanations is that most likely he as been wearing a non Jyotish Quality non effective stone that has had no impact at all on him. So in short an ineffective Gem therapy with No results which is still a better desirable option than an ineffective Gem therapy with bad or poor results. When this chart came for a Gemstoneuniverse Gem recommendation we were able to identify all these points and since the main goal of the Gem therapy is progress in work and profession a classic combination of Natural Pearl and Yellow Sapphire was recommended to him. Moon the ruler of the Cancer ascendant and the Natural Pearl Gemstone is a very powerful planet in this horoscope. If you draw up the chart for academic interest based on the birth data given above you will see the Moon being the ascendant lord is posited in the 3rd house of courage and initiative. Moon by itself gives great results in the 3rd house and in this case will bless him with a lot of initiatives and open new doors and opportunities. Yellow Sapphire is the Gem of Planet Jupiter and Jupiter in this chart becomes the lord of the 6th house of service and competition and the 9th trine house of fate and fortune. 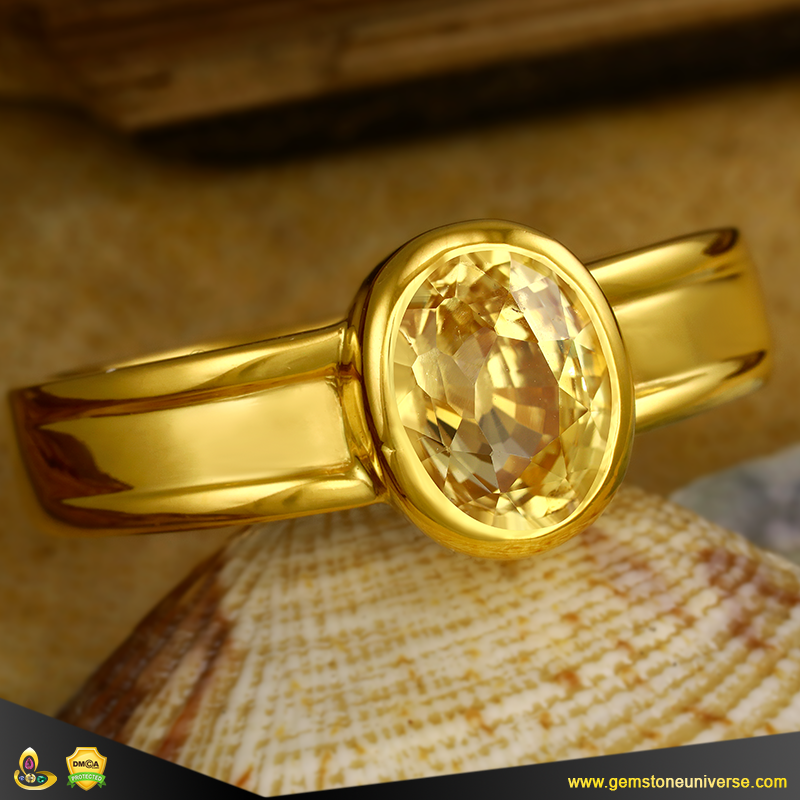 The Yellow Sapphire will bless him with good luck, fortune, wealth, abundance and recognition thereby leading to success in the said objectives of success in career and profession. Comments Featured today is a glorious Unheated Yellow Sapphire from the famed Ratnapura mines. The single outstanding features that really stands out is the old mine cut with fine facets that is making the light movement scintillating and adding to the beauty and allure of the Gemstone. 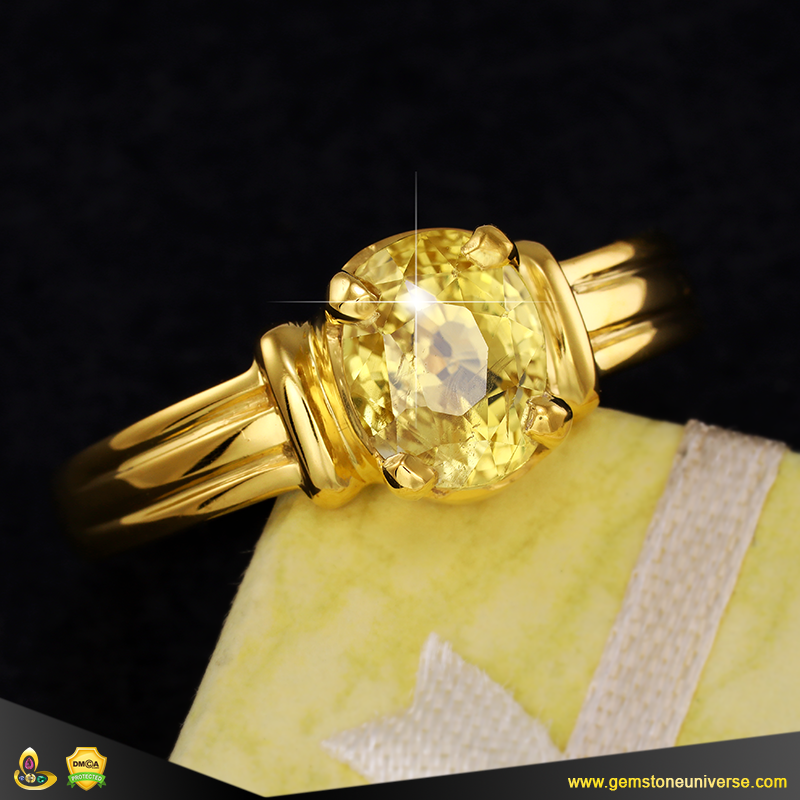 Fine most sought after Golden canary yellow colour combines with a scintillating cut to produce a true Jyotish Gemstone that shall deliver the cherished results only true Jyotish Gemstones can offer. Palpable planetary energies that ensure it’s a fantastic talisman and a beautiful gem. A Real rare treasure that shall deliver the results only real Jyotish Gemstones are capable of. She is one successful advocate aspiring to become a high court judge. She is well experienced and honest in her practice. Objectives above were sent by her Husband. Individual seeking gem therapy has sent the objective statement in a very crisp and clear manner which is free from any kind of ambiguity. The single objective for seeking Gem therapy is to realize the career ambition of becoming a high court judge. Even though this objective is stated in a single line it has a lot of ramifications given the existing judicial system in India, the number of vacancies that are minimal and other qualifications that will enable her to be in the coveted position of a Judge. In modern day career in judiciary and law one has to analyse the position of Mercury in addition to Jupiter with far reaching changes occurring in the functioning of the judiciary. More emphasis is now on communication as well as digitization of records. As more and more judicial case data become online Mercury’s role in the chart becomes very vital in the information age. For a Government related job and position one also has to analyze the position of Sun and the sign of Leo in the horoscope. Venus being the lord of Libra Ascendant and the 8th house of hidden secrets is posited powerfully in the sign of Leo in the 11th house of profits and recognition. All in all a very powerful chart that has all the necessary ingredient for realization of the career objectives of being a judge. 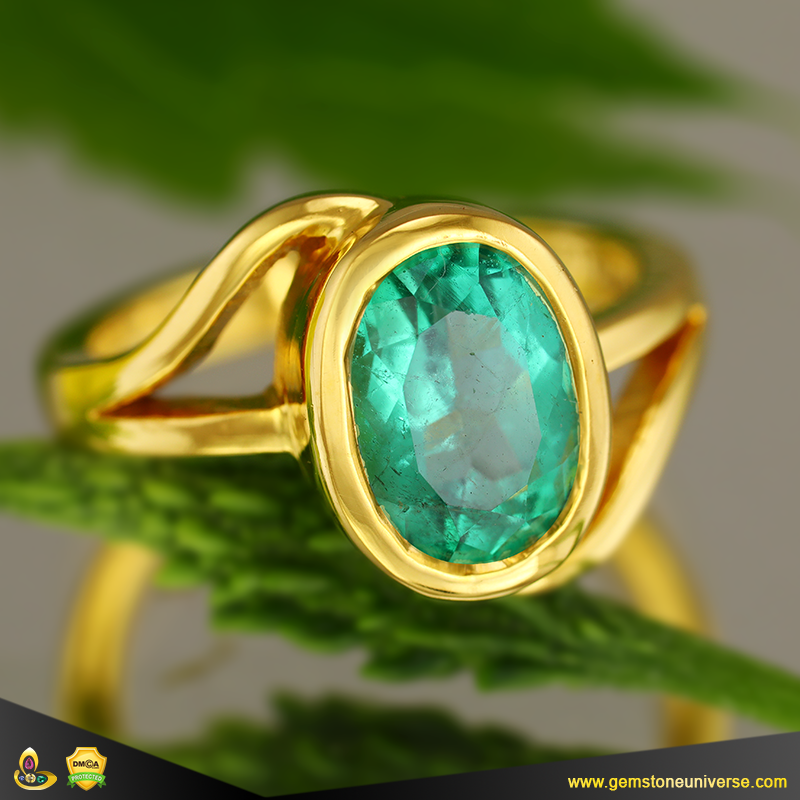 She was advised an Emerald in the little finger of right hand in Gold to boost the power of Mercury which is also a Yogakaraka (a planet capable of causing much good) planet for Libra Ascendant and to activate the power of Venus in Leo in addition a Diamond was advised in the ring finger of right hand in 18K Gold. An optimum Gem recommendation, that will fortify the many positives of the chart and help her overcome some of the negative features. Comments Beautiful, resplendent regal and gloriously verdant Colombian Emerald of 1.70 carats set in 22 K Gold ring. Note that the Emerald is only 2.78 carats but the purity and depth of colour and fantastic clarity lend it the appearance of a 4 carat gem. Even though the emerald has the classic jardine inclusions they are mostly concentrated on the fringes bring in the expertise of Gem selection to the fore. Blessed Late summer grass green colour in this Colombian Emerald that contrasts well with the sheen of 22K high caratage gold to produce a stunning planetary talisman. Heart-warming to see this order coming out of West Bengal where maximum failures of Gem therapy and most poor implementation of Gem therapy happen due the use of higher weight flawed poor stones sold in Rattis. It is glad to see individuals understanding of Jyotish Gemstones and Gem therapy spreading. Why did you seek out Gem Therapy? Share your case objectives & Help Others. 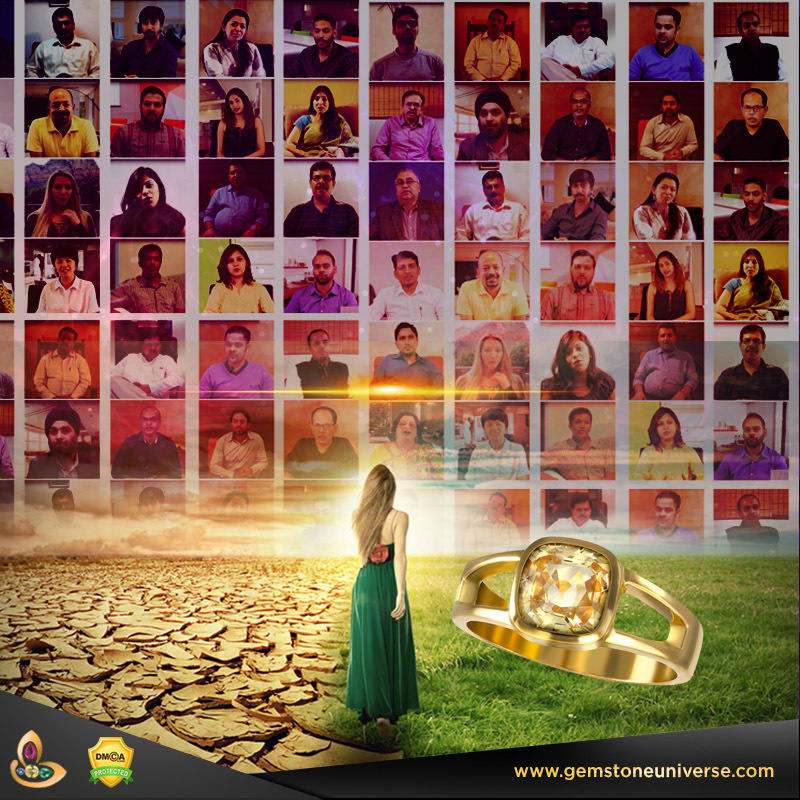 For 22 Years Gemstoneuniverse has been at the forefront providing life solutions by Gem Therapy by accurate diagnosis of certain life conditions by horoscope analysis by Vedic Astrology and subsequent recommendation and accurate Jyotish Gemstones to its Patrons. Many patrons have sent questions asking what exactly can or cannot Gem therapy do? What are the limitations to Gem therapy? What objectives can be met by Gem therapy and what objectives cannot be met by Gem therapy? Statistically speaking in all these rewarding years we have provided 5, 00,000 unique Gem recommendations based on unique planetary positions and unique life conditions faced by individuals and these will serve as a rich educational and research material for future generations. Out of these 5,00,000 Gem recommendations, 100,000 individuals have implemented Gem therapy by ordering Jyotish Gemstones from Gemstoneuniverse and these results are track able and traceable. As of today 17th September 2018, More than 2 Million visitors consume content from the Gemstoneuniverse portal. We have no means or measure to track results of this huge number of individuals who may have implemented Gem therapy after acquiring information from the Gemstoneuniverse portal. Today we are starting this series wherein we just share the life objectives shared by the patrons when placing the Gemstone recommendation order along with the recommendation made by us with no other influencing data that remotely may tend towards any kind of marketing. The entire endeavour of this exercise is to share with you of what exactly is possible with Gem therapy and what is not and to inspire future students and practitioners of Gem therapy of what they should be prepared with should they want to have a rewarding career In Gem therapy or as an Astro Gemologist. A copy of this article will be emailed to all existing Gemstoneuniverse patrons. If you without revealing your private data would be willing to share your results it will be a great help to the community and will help the great science and art of Gem Therapy.